Do you ever prep something and then find it's days, weeks and sometimes months before you get back to it. 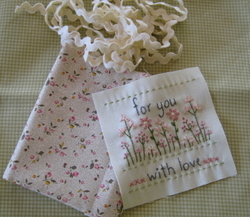 When the Bumble Berries fabrics arrived I immediately cut out the Dressy Hangers and started stitching the gift pillow from For You; they'd be a quick and lovely addition to my gift stash. Now I'm on a roll, again, and the collars are on the hangers and the heart has been stitched. The heart is filled with lavender and I think they look rather lovely together. I hope to finish the other two hangers sometime this weekend, but not tomorrow. Nothing went to plan last night - you know how it is, other demands on your time - so I finished sewing it together this morning. 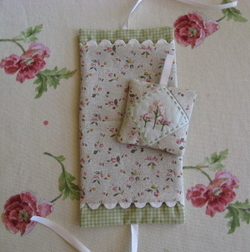 The lavender sachet fits inside the pockets at either end. Last year I made a similar set for a dear friend's birthday and she loved it. Now I have to ask, 'Do you like the fabric in the background?' It's my new ironing board cover. O.K., I know, perhaps it's not that interesting, but I'm very excited. I've been wanting (needing) to make a new cover for some time now and kept putting it off. Today was the day. It didn't take long at all. Even my daughter loves it, she just looked in and told me how good it looked, maybe this tells you just how bad the old one was. There doesn't seem to be any time for sewing of late. I have managed a little stitching over the past couple of days. This is a sample for my pattern From Me to You. 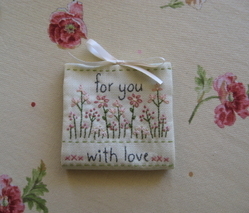 I just had to try stitching it on this beautiful pale green fabric, I couldn't resist buying the other day. There are some gorgeous green fabrics (my favourite colour) in the shops at the moment. The plan is to finish it tonight. I will post a photo tomorrow - so no excuses now. 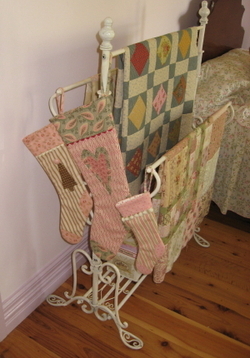 I leave some of my Christmas decorations up all year when they look as pretty this. And yes, they are unfinished quilts in the background. The middle quilt needs to be quilted and bound - a winter job - and the quilt in front ....... Well, initially it was going to be cot sized, but I've decided to make it bigger - single bed size. Which means - a bit (lot) more thought and planning. Now some of you may be thinking I leave my unfinished projects out as a reminder to finish them. No, I'm just being realistic. They may never see the light of day if kept in a cupboard until completed. And they're too lovely for that.